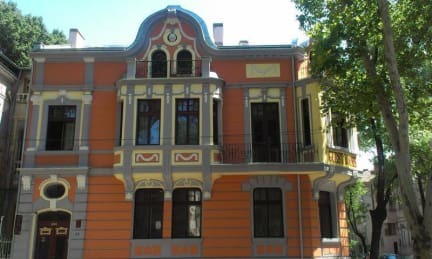 Restored art building from the early 20th century is located in the center of Plovdiv. Only 3-4 min. walk from the central train station and bus stations South and Rodopi. Perfectly located to the city park, central square and the central pedestrian street with shops and restaurants, in which is only 10 min. walk to the old town and the sights of the city. 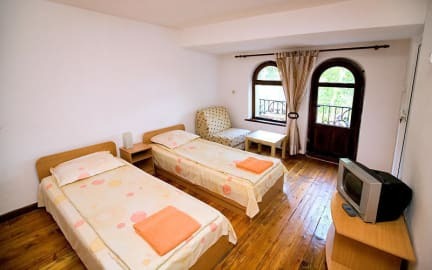 You can expect unique rooms decorated in comfortable style and panoramic view, a bedroom, two or three beds offering excellent conditions for recreation, cable TV, free Wi-Fi, shower and toilet.There is washing machine, iron, microwave, refrigerator. The highest standard of cleanliness and comfort. There is quiet balcony to enjoy breakfast and coffee. This hostel was the nicest we stayed in on our 3 week trip. Biro, our host was amazing. It was like meeting an old friend again. The room was beautiful and immaculate and we even had a wee balcony looking out over the town. The shower was great and we will definitely stay here again. Right between the old town and the train station. Brilliant. This stay was a very last minute decision of which I am glad I made the building is very close to the train station and centre it is a beautiful building the host was very nice and helpful the room was lovely I would definitely stay again:)! Awesome rooms with so much space, great location. Not really any staff access available, but if you're ok figuring things out for yourself then it's great. Good beds, wifi and air con. Clean, great place, incredibly gorgeous rooms and friendly owner and wife who gave us a map and helped us book taxis etc when we were leaving. Not great for meeting people but great for a couple f group! We had a pleasant stay. Basic but comfortable and clean room. Location is excellent. The hostel is at a very nice location, close to everything. Room was clean and has an AC. Overall the hostel is great if you are looking for a quiet place to stay that is at a good location. If you wish to stay at a place with a great social life, this might be an issue but other then that it was good. Cosy old house; some pieces of furniture and decor create pleasant atmosphere. Nice terrace. All people were friendly, but the owner's wife might look a bit more friendly. However, in spite of her appearance, which could be just a tiny bit friendlier, she helped us - gave us a room one day earlier, because I had made a mistake with the dates. Additional folding bed broke down in the middle, but I fixed it using blankets. Hope, they'll replace it. Because I really symphatize with this hotel. Premise is clean, at a street within walking distance to city center & train/bus stations. We booked twin room with private bathroom, but were given room with shared bathroom. It's not help when the lovely lady received us couldn't speak a word of English to understand our question. Our bus from Istanbul dropped us off at 4am. Despite what the premise claims to have 24 hours receptionist, we're not allowed to enter & told to come back at 1! We had to spent cold morning on street till sunrise.